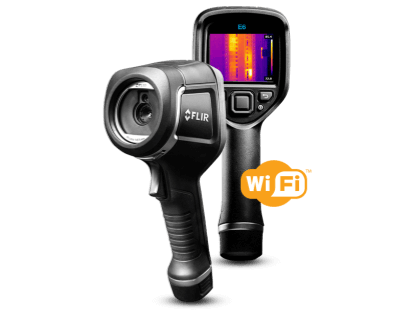 Read reviews, pricing information, features and frequently asked questions for the Flir E6 Thermal Imaging IR Camera with Wi-Fi. The Flir E6 Thermal Imaging IR Camera with Wi-Fi is a thermal camera that can be used for thermal imaging in a variety of maintenance applications. Images from the camera can be shared on mobile devices via your wireless internet connection. Pros: Wi-Fi connection. Automatic focus. Rugged design. Cons: E6 model is expensive. No flash function. Bottomline: An accurate, easy to use camera for thermal imaging. The design makes the camera both portable and durable on the job site. How much does the Flir E6 Thermal Imaging IR Camera with Wi-Fi cost? The Flir E6 WiFi camera retails for $1,979.00. How can I transfer images from the Flir E6 to my mobile device? You can add and manage images on your mobile device by using the Flir mobile app. The app is available in the App Store and on Google Play. Can the camera be used to detect leaks in a roof? The E6 is designed to detect variations in temperature, so you could only use it to detect a leak if the water was warmer or cooler than the roofing material. How do you charge the Flir E6 thermal camera? The camera comes with a charger that you can plug into a regular power outlet. Flir E5-MR77 E5 Thermal Imaging IR Camera w/ Wi-Fi & MR77. This is a really nice unit. A friend has one of these for his company and they put it to good use every week. 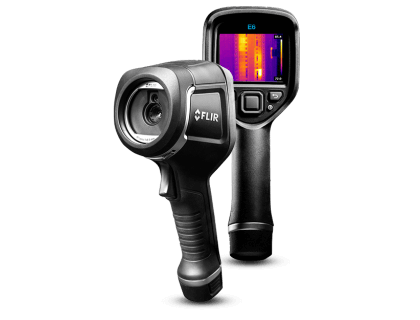 Flir is a top company and they stand behind their products. I use an E6 which has less resolution than the E8 but still has the MSX. I really like it for day to day work. It's also fast and doesn't require much if any setup to just " point and shoot". If you purchase one you can retire your old IR laser spot thermometer as you will never use it again.